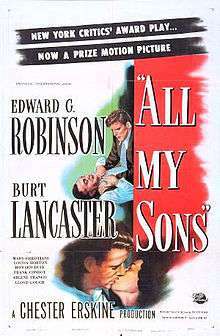 All My Sons is a 1948 American drama film noir directed by Irving Reis, based on Arthur Miller's play of the same name, and starring Edward G. Robinson and Burt Lancaster. 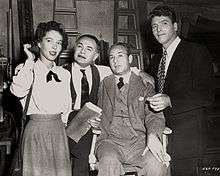 The supporting cast features Louisa Horton, Mady Christians, Howard Duff, Arlene Francis and Harry Morgan. Joe Keller is sorry to hear son Chris plans to wed Ann Deever and move to Chicago, for he hoped Chris would someday take over the manufacturing business Joe built from the ground up. Joe's business partner used to be Ann's father Herb, but when both men were charged with shipping defective airplane parts that resulted in wartime crashes and deaths, only Herb was convicted and sent to prison. Another son of the Kellers is in the Army air corps, missing in action and presumed dead. Ann used to be engaged to him and her engagement to his brother upsets Kate Keller, who hasn't yet accepted that son Larry is gone for good. Ann's attorney brother George strongly discourages him from marrying a Keller, and many in town still whisper that Joe was responsible for many brave young men's deaths. A war widow even calls Joe a murderer to his face in a restaurant. On a visit to Ann's father in prison, Chris hears how Joe called in sick on the one day the Army came to pick up the airplane parts. Joe admits to Chris that he knew they were defective, but repairs would have been costly and could have bankrupted the business. Chris strikes his father in anger at hearing this. A letter from Larry reveals that he knew of his father's guilt and intended to go on a suicide mission in a plane, no longer wanting to live with the family's shame. This is the final disgrace for Joe, who shoots himself. In his film review, critic Bosley Crowther contrasted Arthur Miller's play to the screenplay. While stating that the screenplay was more restrained, he praised the acting. He wrote, "In the role of this rugged individualist, Mr. Robinson does a superior job of showing the shades of personality in a little tough guy who has a softer side. Arrogant, ruthless and dynamic in those moments when his 'business' is at stake, he is also tender and considerate in the presence of those he loves ... As the right-thinking son of this corrupt man, Burt Lancaster is surprisingly good and, although he appears a bit dim-witted at times, that is not implausible. Louisa Horton is natural as his sweetheart and Mady Christians plays the mother intensely. Irving Reis' direction is slightly stilted in some scenes but generally matches the tempo of a fluid script". Writers Guild of America Award: Best Written American Drama - Chester Erskine; The Robert Meltzer Award (Screenplay Dealing Most Ably with Problems of the American Scene) - Chester Erskine; 1949. ↑ All My Sons at the American Film Institute Catalog. ↑ Crowther, Bosley. The New York Times, film review, March 29, 1948. Accessed: August 12, 2013. Wikimedia Commons has media related to All My Sons (film).